TORONTO, May 10, 2018 /CNW/ - In honour of National Caesar Day on May 17th, Canadian vodka brand Polar Ice Vodka® and The Keg Steakhouse + Bar are joining together by celebrating Canada's National Cocktail: The Caesar. It is commonly understood that the first Caesar was created by Walter Chell at the Calgary Inn which is now The Keg Steakhouse + Bar located at 4th Avenue inside the Westin Hotel. Having been officially named Canada's National Cocktail by Parliament in 2009, National Caesar Day is a day that celebrates a moment in Canada's culture. Polar Ice Vodka®️ has been the Keg's choice for their famous Caesar since the 1990s. 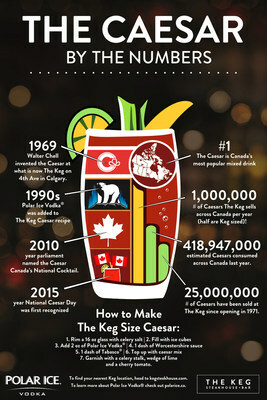 More fun facts about the classic Caesar can be found in a custom Keg Size Caesar infographic. This year, The Keg is unveiling a new twist on the classic Caesar in their summer drinks menu: The Prescott Caesar, featuring J.P. Wiser's® Deluxe whisky and the addition of pineapple juice. Look for it at The Keg starting May 14th. Can't get enough of Keg Caesars? Fans can enter to win a private tasting menu dinner for eight at The Keg by participating in the Keg Size Your National Caesar Day Contest. Visit kegsizeyourcaesar.ca and answer the question: "Why do you think the Caesar is Canada's best cocktail?" *Eligible applicants must be of legal drinking age and located in Canada (Quebec excluded). To find your nearest Keg location, head to kegsteakhouse.com. To learn more about Polar Ice Vodka® check out polarice.ca. The Keg Steakhouse + Bar has been serving great steaks across Canada and the US for over 45 years. Quality has been a cornerstone of The Keg's success since its first restaurant opened in Vancouver in 1971. The Keg's focus has been, and continues to be, on providing exceptional service and quality food in a comfortable atmosphere for its guests. For further information, please visit www.kegsteakhouse.com.